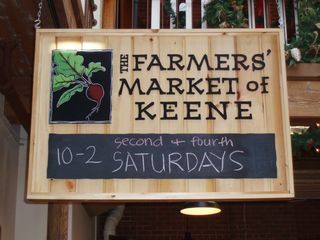 Like a lot of communities across the country Keene has a growing farmers market and they were looking for an indoor location for the winter. My good friend Deb from Elm City Brewing Company was generous enough to allow them to use some space next to the pub and that inspired us to make them a sign. It is technically still our sign and only time will tell what happens with the sign at the end of the winter but until then it will provide great visibility for the market. If nothing else it will look good hanging in our shop. The wood is port orford cedar that was culled out for blemishes from Bensonwood Homes in Walpole NH. Cut black pvc letters and a digital print of the artwork and finally a chalkboard section at the bottom. I was thinking fruit crate when I put it together.